Miracast technology, one of the lesser talked about features of the Nexus 4, hasn’t had much play over the last month or two as adapters and TVs with the capabilities have yet to really reach the mainstream. There are a couple though, one of which happens to be the Netgear Push2TV PTV3000, which can be found at a variety of tech retailers. I picked one up yesterday, updated the firmware on it, and decided to take Miracast for a spin so that the DL community can see what it’s all about. 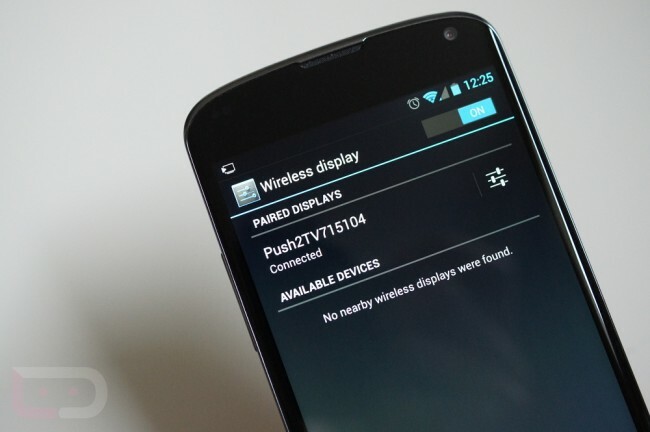 What is Miracast? It’s a technology created by the Wi-Fi Alliance to give users the ability to share content between screens over WiFi. Most of you know this as mirroring, something that can already be done over a hardwired connection in a variety of HDMI docks. The beauty of this, obviously, is that you don’t need wires. You simply need Miracast built-in, a WiFi connection, and a TV, monitor or smartphone. So as you can see from the video, it’s a neat technology, but until we get official firmware on devices like the Netgear PTV3000, it has some issues. In a way, it reminds me of NFC, in that it’s a fabulous idea that needs industry-wide adoption in order to be fabulous. *Note – I’m told that this works with the Galaxy S3 and Note 2 and AllShare Cast, however, I had issues trying to connect my Note 2. There are apparently other firmwares out there that work better depending on the device. 2. Plug-in your PTV3000 to a power source. 3. Push the WPS button on the side of the unit for more than 5 seconds. 6. This is the firmware update page, so follow the instructions. 7. Browse for the new firmware that you downloaded above, and upload it.